Migration advocates have a stable of myths they commonly repeat, and because their numerous friends in the media repeat them too, the general public tends to believe these false claims. AIC Foundation posts a weekly “fact checker” to refute these and other media-induced myths. Immigration advocates claim that immigration will significantly lower our average age, thereby providing an adequate number of young workers to support those retirement programs. It is true that the present level and character of immigration will raise the percentage of working-age people (16 to 65) over time, but the increase will be negligible—far too small to make meaningful contributions to Social Security and Medicare. To illustrate, in 2010, 66.6 percent of our population was working-age. By 2050, that total, without any immigration, would drop to 59.2 percent. With current high immigration levels, it would only rise to 60.3 percent. The percentage would be higher if we had an immigration policy that specifically selected for young immigrants, but such a goal would conflict with existing priorities for immigrants, including family ties and diversity. Given the constituencies for these categories, it seems unlikely that an overall age preference could be enacted. Current immigration policy will not make us much younger, but it will make us a lot more numerous—to the extent of 80 million more people in the next 33 years. This rapid surge of population will place considerable stress on our finances, infrastructure, and environment. The attendant growth in diversity will strain national unity. Social Security won’t gain from it, but social insecurity just might. Source: Steven Camarota, 2012 “Projecting Immigration’s Impact on the Size and Age of the 21st Century Population,” Center for Immigration Studies. If we truly had a shortage of workers, some key statistics would reflect it, but they don’t. One example is wage levels. Since 1970—when mass immigration began to take off—U.S. wage levels in constant dollars have stagnated, even as our productivity has increased. Also, if we truly had a labor shortage, the percentage of the working-age people in the workforce (18 to 65) would be increasing. In terms of numbers, there were 48.1 million working age-natives not working in 2015. A further point to consider with respect to the labor shortage claim is that we are now entering an age of greatly increasing automation. According to a study done at Oxford University, almost half the jobs now being done by people in the U.S. will be automated within the next twenty years. In this situation, claims of a labor shortage will be even harder to sell than now. Sources: “A Decade of Flat Wages: The Key Barrier to Shared Prosperity and a Rising Middle Class,” 2013 Economic Policy Institute; Public use file of the Current Population from the second quarter of 2000 and 2015; MIT Technology Review, Report Suggests Nearly Half of U.S. Jobs Are Vulnerable to Computerization, Aviva Rutkin, 9/12/13. Commonly we hear that we need not worry about immigrants taking U.S. jobs because they excel at creating businesses which create new jobs for everyone. The basis of this myth is that some national groups of immigrants are more likely than natives to create businesses. But it ignores the reality that other groups are less likely to be entrepreneurs. Overall there is very little difference in the percentage of natives who are self-employed (11.1) and immigrants (11.4). This slight edge in favor of immigrants, however, is mitigated in favor of natives by several factors. One is that natives have a higher rate of part-time self-employment, 1.7 percent, compared with 1 percent for immigrants. Another is that a higher percentage of native-owned businesses (19 percent) employ more than ten workers, compared with 16 percent for immigrant-owned firms. Also, immigrant-owned businesses tend to hire other immigrants, usually of their national background, rather than natives. Immigrants do reasonably well in business, achieving at a level comparable to that of natives. But they are not the entrepreneurial supermen portrayed by immigration advocates. Source: Public use file of the 2015 Annual Social and Economic Supplement of the Current Population Survey. Figures are for employed persons 25 and older. There are restrictions on immigrants getting welfare, but numerous loopholes keep them from having much effect. Immigrants aren’t supposed to become “public charges,” but this only applies to cash benefits, and this restriction is seldom if ever enforced. Immigrant-headed households use significantly more welfare (51 percent) than native-headed households (30 percent). Interestingly, immigrants have a slightly higher participation rate in the workforce than natives. The problem is that many working immigrants work at low-wage jobs, and their low salaries qualify them for welfare. Continuing mass immigration helps to keep those wages low. 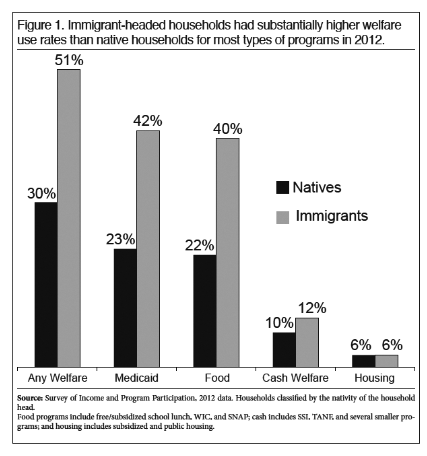 Source: Steven Camarota 2015, “Welfare Use by Immigrant and Native Households: An Analysis of Medicaid, Cash, Food, and Housing Programs,” Center for Immigration Studies; All Employment Growth Since 2000 Went to Immigrants, Center for Immigration studies Backgrounder, Karen Zeigler and Steve Camarota, June 2014. This is a statement commonly made by some conservatives who believe that immigrants have a love for freedom, family values, and other characteristics that will incline them to support conservatism. Yet data show that Hispanics and Asians, groups with the largest numbers of immigrants and first generation citizens, strongly incline to liberal positions—particularly on government and economics. As a consequence, they favor Democrats by a margin of 2 to 1. A key conservative issue is limiting the size of government. Forty-eight percent of the general public favor smaller government and fewer services, but only 19 percent of Hispanics and 36 percent of Asians share that view. Conversely, 41 percent of the general public want larger government and more services, compared with 75 percent of Hispanics and 55 percent of Asians. Hispanics have a strongly negative view of capitalism, with 55 percent expressing this view, compared with 40 percent of the general public. Among the reasons for the leftist economic bent among immigrants is that many are from countries with that outlook. Also, many of them settle in liberal urban areas of the U.S., and that political climate tends to influence them. They also may embrace liberalism out of self-interest for welfare benefits and affirmative action. I have a daughter in middle school near Seattle. This middle school is about 70 % Central American. Many of the students brag about being here illegally. They refuse to say the pledge of allegiance. They bring in Mexican flags Some of these students bring drugs to the school to sell. They are 12-13 years old. They say that their parents are dealing drugs. They also say that their parents are gang members, and laugh at the police. Some of the students carry guns into the school. Nothing is ever done, and many of the teachers want open borders. Some teachers came to school wearing black for many weeks after President trump was elected. My question is this : HOW ON EARTH CAN MY DAUGHTER RECEIVE AN EDUCATION IN THIS ENVIRONMENT ? Stay the course – stay strong. God sent Mr. Trump to save us from our self may we get on our knees and thank God every day!